Normally the AICUO Graph of the Week speaks for itself, but this week’s presents a concept that focuses a complex analytic lens on interstate migration — how residents of the U.S. move from state to state. It also supports previous work sponsored by Gov. Bob Taft’s Commission on Higher Education and the Economy that refutes the claim that Ohio is witnessing a “brain drain” of residents leaving the state. 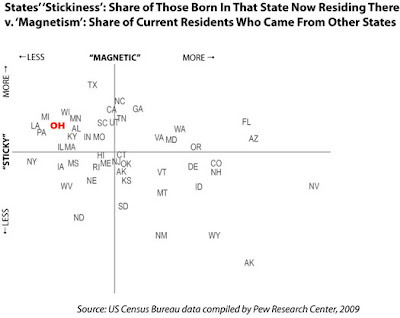 The concept, as developed by the Pew Research Center, defines a “magnetic” state as one with a relatively high ratio of its citizens that were born in another state. Between 2005 and 2007, the period analyzed in the study, Nevada was the nation’s most magnetic state with more than 85 percent of its residents born elsewhere. New York was the least magnetic, with fewer than 20 percent of its residents having moved there from other states. The median of the 50 states, denoted on this week’s graph by a vertical axis, is 39 percent. A “sticky” state is one with a relatively high percentage of those born in that state currently residing there. In the study, Texas is the nation’s stickiest state, with just above 75 percent of its native-born population still living there; while Alaska, a highly magnetic state, was the nation’s least sticky, with a little over a quarter of its native population still there. The median “stickiness” statistic is 58 percent, which is the graph’s horizontal axis. Statistically speaking, there is a strong negative correlation between “magnetic” and “sticky”: that is, a magnetic state is likely not to be a sticky state, and vice versa. But there are exceptions, as noted in the report. Many Sun Belt states, like Florida, both Carolinas, Georgia, Arizona, and states in the Northwest are both magnetic and sticky. Many states in the northern and midwestern U.S., like both Dakotas, Iowa, New York, and Maine are neither sticky nor magnetic. Ohio is a sticky but not a magnetic state, meaning that, relatively speaking, it keeps its native residents but does not attract residents from elsewhere. A similar point was raised in a study performed in 2003 by Dixie Sommers of Ohio State University’s Center for Human Resource Research, on behalf of the Governor’s Commission on Higher Education and the Economy. Sommers’s study refutes the claim that supporting higher education in Ohio actually serves other states’ workforces, as it uncovers the state’s key demographic problem: Ohio does not attract young, college-educated adults nearly as well as other states. The Pew Research Center study supports the CHEE report’s findings. The full report, including an interactive graphic presentation of the data, is available at the Center’s Web site.